Old phonograph, originally uploaded by bbmarie. Rainy cold days in spring can be tough to slug through. It helps me to remember that the rain is just what the seeds need to get them going, and the green sprouts pushing up through the loose soil. Our back yard garden is full of signs of renewal. It is just getting going but is has started. I have a image here of an old phonograph. When the CD player came on the market it seemed like the days of vinyl where over. It was time to pitch out the record players because they had been replaced with something better. Nearly all those old machines dropped out of sight into the trash, the junk stores or dark forgotten corners of the attic or the basement. What is interesting now is how those machines are coming back out of the dark places. The phonograph and vinyl records are being rediscovered by a whole new generation of kids that didn't grow up with them. Is being forgotten for a time like being planted? Are there times when we feel forgotten and displaced. Do we feel like we have been replaced by the next new thing ? I know I feel that way from time to time as I get older. I think that God appoints times of hiddeness from time to time which feels uncomfortable like a cold rainy day. Uncomfortable but important because we are being prepared for something, prepared for a time and a place in which to bloom anew. 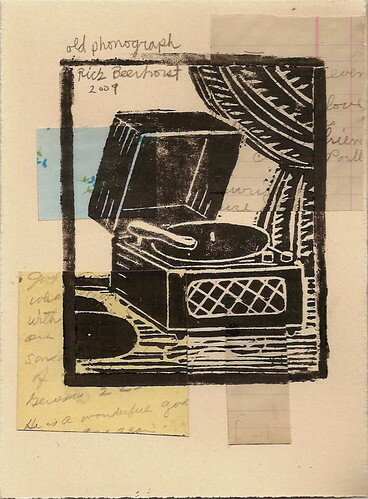 This phonograph print is made from bits and pieces of old ephemera that was thrown away and forgotten. I plucked these pieces out of the trash and made something new and mysteriously beautiful by artfully knitting them together in a way that makes sense.